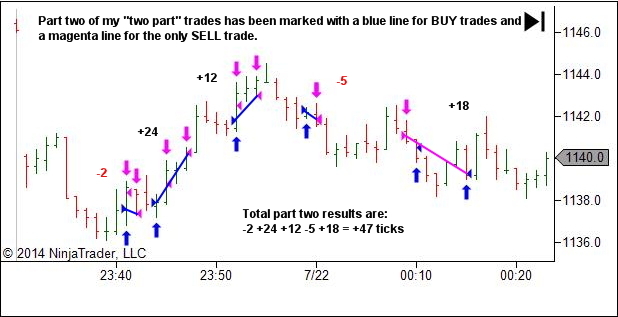 And in the following chart we see the part two trades. Now, not every series of five trades works out this well. Many lose. Many produce results around breakeven. 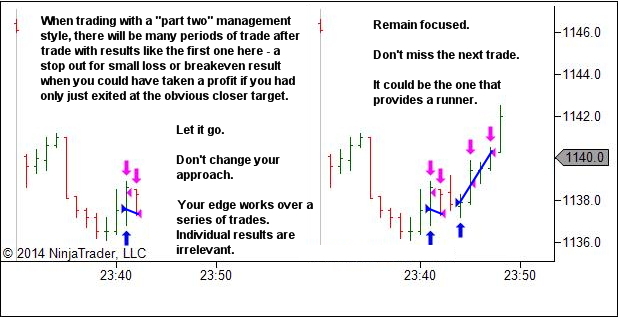 And you’ll find that in any series of trades it won’t always be part two providing the greater outcome. In a particularly rangebound or choppy market environment you may find that part one outperforms part two. Likewise If you’re not reading the bias well and so don’t achieve much follow through to part two targets. 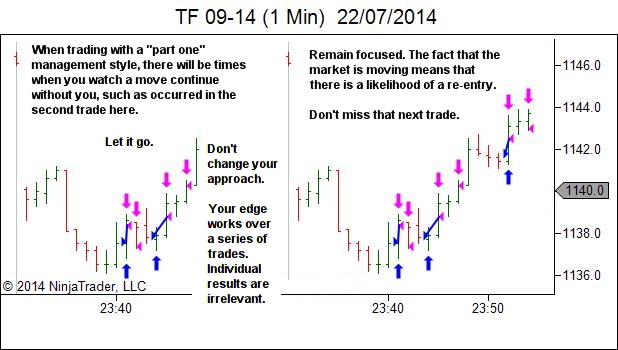 The profit in this series of trades is not the point of focus. Both part one AND part two contribute to my edge. Sometimes part one provides the greater result. Sometimes part two does. But I expect that (over a series of trades) both will contribute. So if circumstances force you to operate with one contract, it doesn’t matter whether you choose to adopt a “part one” management style (quicker, higher probability profits at the first obvious point of potential resistance) or a “part two” management style (holding for larger gains – a lower probability option with greater payout when it works). Either, over time, should provide an edge. If you’re trading live then you should have already proven an edge in the sim. If not… get back to trading the sim first until you have proven an edge in that environment, and use this time to continue working to build your account. Analyse your sim trading results. 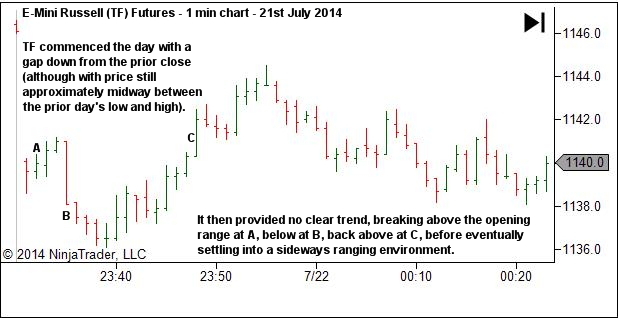 If you traded the sim using single part positions then the answer to your question is simple – continue to do the same in a live environment. 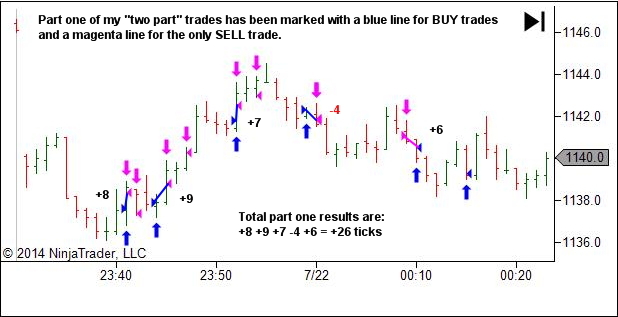 If you traded the sim using two part positions and only one part was consistently profitable – continue to trade that part in a live environment. If you traded the sim using two part positions and both parts were consistently profitable – pick the one that was most comfortable psychologically. Do you prefer the idea and feel of smaller, more regular locked-in gains; grinding your way towards your profit goals, while accepting that you’ll often watch the move continue without you after your exit? Or are you more comfortable capturing the occasional larger trade, while accepting that there will longer periods of breakeven or slightly negative results when market conditions and your trading performance do not allow for these larger trades? If you’ve proven an edge via both styles of trade management, then either will work. Pick the one that feels the best and stick with that. Either way, if you really do have an edge you’ll profit over a series of trades. Choose one of the other management style. Neither is right or wrong. They’re just different; with the difference being primarily psychological. The benefit of multiple-part management is the ability to diversify across different psychological outcomes. With one part you’ll need to just accept periods of underperformance. 2. Building your account until it reaches the point where you can add a second contract. Having achieved this increase in account size, you may well choose to continue trading with just one part. But at least you now have some choice. All of the above is opinion only. This is just how I would personally trade a small account with one part positions. I don’t have insight into your personal needs and circumstances (financial, lifestyle, degree of skill and knowledge, mindset and risk tolerance). Hopefully though you can find something here to help you in finding the right path ahead. Again though… seriously consider remaining in a simulator environment while building your account. Summary – it doesn’t matter which management style you choose. Both will incur psychological challenges due to underperformance. Both have the same goal – building your account to the point it allows multiple contracts. Both will achieve the goal if your edge is real. Both will fail if your edge is not real. Now having said this, I’d like to throw a spanner in the works and suggest some other options and considerations. Lance: Do you risk 1% per trade for your 2 contracts or dial it up to 2% for the 2 contracts? A normal two part position is just under 1% risk. Thanks a lot Lance Sir. Another gem from you. It will certainly help me a lot. Thanks Candle! 🙂 Glad you liked the article.